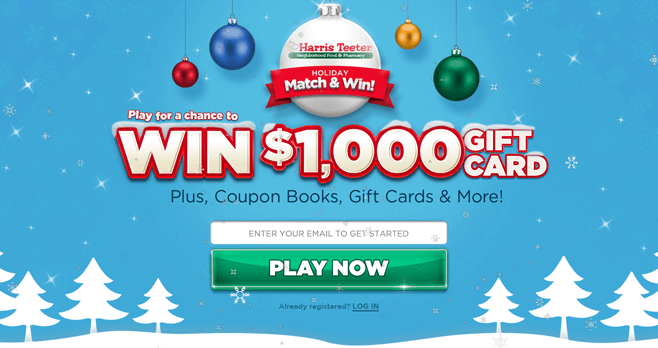 The Harris Teeter Holiday Match & Win Sweepstakes is here! It’s now time to play at HolidayMatchAndWin.com for a chance to win Harris Teeter gift cards, and coupon books. One lucky grand prize winner will score a $1,000 gift card and 2,000 other winners will get a coupon book valued at $100. Plus, over 100 instant winners will each receive a Harris Teeter gift card worth $50 or $75. Play every day and use game code WIN695 to earn 10 additional game plays. Harris Teeter Match & Win is open only to legal residents of Delaware, Georgia, Maryland, North Carolina, South Carolina, Virginia, and the District of Columbia who are at least 18 years old at the time of entry. The Sweepstakes begins on November 25, 2016 at 12:00 a.m. ET and ends on December 22, 2016 at 11:59 p.m. ET. On or about January 3, 2017, the Administrator or Sponsor will select one entry for each drawing prize in a random drawing of all valid entries received. Sponsored by Harris Teeter, LLC, P.O. Box 10100, Matthews, NC 28106. Administrated by Launchfire Interactive, Inc., 22 Hamilton Ave N, Ottawa ON, K1Y 1B6 Canada. 1 grand prize will be awarded. Grand prize winner will receive a $1,000 Harris Teeter gift card. 2,000 secondary drawing prizes will be awarded. Each secondary drawing prize winner will receive a coupon book. During the Sweepstakes Period go to www.holidaymatchandwin.com where you will be required to register by providing your name, email address, state, zip code, password and accept the Official Rules. Once you have completed registration you will automatically receive 5 game tokens. Game tokens are used to play a game called “Match & Win”. From the Home Page, to play a round of the Match & Win game, simply click the “Play Now” button, which will require you to use one Play. At the beginning each Round, you will be randomly assigned 4 recipes, whereby each Recipe will be composed of a pre-determined number of ingredients boxes and each Recipe will be automatically assigned a pre-determined number of entries into the Grand Prize Draw. You will also be randomly assigned 6 ingredients that will populate the corresponding Ingredient Boxes in the applicable Recipe(s). During each Round, after you have first been assigned 6 Ingredients, you will have the option of selecting to re-draw the Ingredients you have been randomly assigned up to 3 times. However, during any given Redraw, only the Ingredients you have chosen to remain as “unlocked” will be redrawn, as any Ingredient that you have selected to “keep” will not change. You are not required to execute all 3 Redraws, as you can select to end the applicable Round at any time by selecting “Collect Unlocked Recipes”. However, if you choose to execute all 3 Redraws in any applicable Round, the Round will automatically end after the third Redraw. The purpose of the Game is to unlock as many Recipes as possible before the end of the applicable Round. You may only unlock a Recipe by populating all of the Ingredient Boxes that compose the Recipe with the corresponding Ingredients that you have been assigned at the end of the applicable Round. At the end of a Round, you will obtain all of the Entries that correspond to the Unlocked Recipes, as determined by the Sponsor at its sole discretion. The number of times you play the game is limited by the number of game tokens you have earned. Each game token can only be used on time. Opt-in to Harris Teeter emails and receive 10 game tokens. Limit of 10 game tokens for this activity. Answer quiz questions. You will receive 2 game tokens for each quiz you successfully complete. Limit of 18 game tokens for this activity. Sharing: You will be awarded additional game tokens when your peers register for the Sweepstakes though their invitation (5 game tokens each friend that registers, max 15 game tokens). Facebook: Allows you to post a sweepstakes link to their Facebook wall. Entering game codes that will be released on Twitter and Facebook. Receive 10 game tokens for each game code. Limit of 20 game code for this activity. Entering game codes that will be released for making an in store purchase at Harris Teeter. Receive 10 game tokens for each game code. Limit of 80 game code for this activity. Alternative method of entry. To receive PINs without a purchase, go to www.holidaymatchandwin.com/npn and follow the online instructions. You will receive one PIN code for each alternative method request. Limit of 80 game tokens for this activity. For complete details, including Official Rules, visit www.holidaymatchandwin.com. How do we find out who won and when will we receive our coupon books we won?